After a debacle in Abu Dhabi – and another occurrence involving offload and a 4 hour delay – I was asked to prepare some specific advice for Captains operating out of Abu Dhabi. Due to high temperatures, most Abu Dhabi departures during mid-Summer experience a potential performance penalty for departure; in most cases resulting in loss of revenue payload, possible departure delays due offload and in the severest of cases the offload of all Cargo, Standby Passengers/Bags and Revenue Passenger Bags to enable departure. 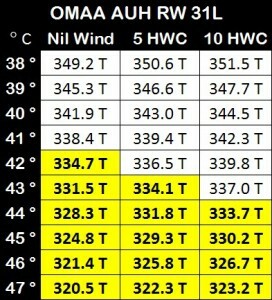 At this time of year the midday temperatures in OMAA are in the mid 40’s. When contrasted with the average load carrying capability for our 777’s in these temperatures; and the high loads of passengers and freight departing Abu Dhabi during Summer – it’s clear that crew will be required to plan for a performance limitation on takeoff. Note : The data provided here is for information only and not for operational use. Any statements of rules of thumb; values of temperatures and winds; preferred runway selections; performance limit weight changes due ambient conditions such as Temperature, Wind, Runway Selection, APU-PACK usage etc are informational only – all takeoff performance estimates must be verified and calculated by the crew in the actual operating environment of the day. From the charted data – it can be seen that increasing temperature has a significant impact on the load carrying capability of the aircraft. Once below the Certified Takeoff Weight, each degree increase reduces the takeoff performance limit by at least 3 Tons – often more. Assuming a full load of passengers and crew – at planning temperatures of 40 and less, some revenue cargo can be carried for the departure. However as the temperature increases, the performance limiting condition reaches a point where revenue cargo cannot be carried. In a highly subjective calculation – this is indicated by the yellow/bold sections of this sample chart. Your mileage may vary. It can be seen that an increasing headwind component helps increase load carrying capacity by an average of 300 Kg/Knot. However this rule of thumb is far from reliable because there are points at which headwind helps with a specific performance limit and the increase in permitted takeoff weight is higher (900 Kg in some cases for 1 knot increase in wind). Crew must examine various contingencies of the wind before deciding on a planned set of departure conditions. 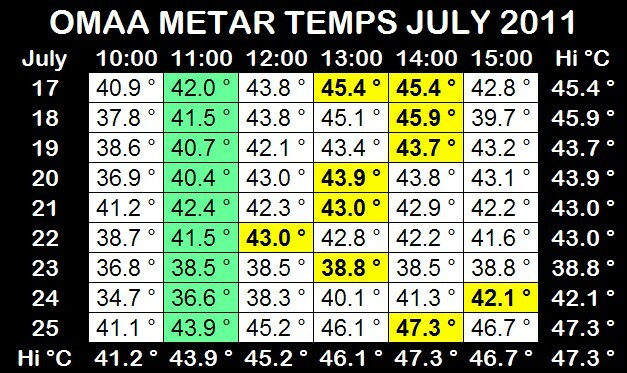 Our departure time of 11:00 am leads up towards the peak heat of the day. This has two operational impacts. Temperatures are high and therefore our capacity to fill the aircraft is compromised. Additionally any significant delay to the departure – such as to offload cargo/standby passengers in order to comply with a weight restriction – takes the aircraft into even higher operating temperatures. 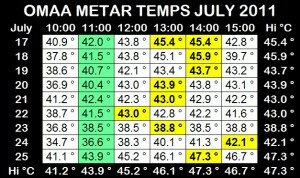 Once into this peak temperature regime (about 14:00 Local) it can be up to 4 hours after scheduled ETD before temperatures reduce. 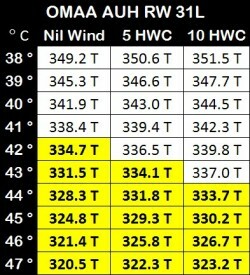 During the morning temperatures build and OMAA general experiences southerly (crosswind) to easterly (HWC RW 13) winds of up to 10 knots. That said – usually the breeze is less than 5 knots and of variable direction. Between late morning and early afternoon a wind change is usually experienced (RW13 -> RW31) and winds of up to 10 knots can result. Once the sea breeze is established it’s normal for temperatures to commence a slow decrease through the rest of the afternoon. All runways in Abu Dhabi are of equal length and approximately equal slopes (actually 0.05% up to North/West). There are obstacles in the database off the end of all runways, and RW13 L&R have an EOP. 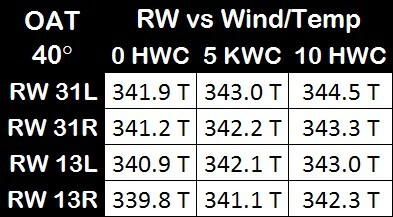 It is this last factor which determines that generally RW31 gives better takeoff performance than RW13. However this advantage is generally less than 1 Ton and is quickly negated by wind. APU to PACK will generally provide a takeoff performance increase of about 3.5 Tons. Crew should familiarise themselves with the APU to PACK procedure from the FCOM SP during pre-flight; and consider reviewing the APU to PACK detail in the D5 OPT Guide prior to flight operations in Abu Dhabi. Use conventional data entry procedures to enter all takeoff data as planned for the departure – even if you’re not sure those figures will be used for takeoff. Select APU in the Assumed Temperature line, verifying small font APU on the Upper EICAS. After engine start verify large font APU on Upper EICAS and Single Pack APU operation. If deemed necessary delete the APU entry in the Assumed Temperature line of the CDU THR LIM page and verify dual pack operation to the cabin. This action will delete the takeoff speeds from the FMC. Plan to position near the runway such that a short delay will be acceptable to ATC. When ready, perform the FMC Final Performance Entry procedure in full and re-enter takeoff performance data while the aircraft is halted with both operational crew involved as scripted. Complete Takeoff Review and the Before Takeoff Checklist when ready. If APU to Pack should fail – Turn the Packs OFF (refer to SP) nearing the runway (note 30 seconds minimum before thrust advancement) in place of APU to Pack. When planned at 40 OAT – the flight can include 10-15 tons of cargo with a full load of passengers, based on a re-dispatched OFP fuel load. However if temperatures increase and a subsequent offload (or non-load) of Cargo is undertaken – even with 3 ton below refuelling the aircraft can be left with too much fuel to even depart with minimum passenger load. If an over fuel situation develops, De-Fuelling is almost always NOT an option. One option to consider is pushback and taxi to hold near the runway – to wait for fuel reduction (minimum 2.0 tons per hour during taxi) or improved ambient conditions (post peak temperature, wind change, sea breeze). The Flight Plan will be prepared to a forecast temperature at the time of departure plus (based on recent operational experience) a margin. In all likelihood it will include some capacity for revenue freight. Obtain an estimate of the ZFW required for Revenue Pax/Bags and Standby Pax/Bags from the AUH Ramp Dispatcher. Obtain a minimum fuel OFP from Nav Services for this ZFW. This will enable the crew to decide to offload/not load cargo (and potentially standby passengers/bags) – and be left with just the fuel required to complete the mission, giving the minimum takeoff weight available for departure and therefore the greatest margin to the performance limited takeoff weight. Although the correction figures could be considered to correct for freight offload – the magnitude of values involved are beyond the accuracy of the LAND/RAMP correction figures. Pre-Flight : can be characterised by finger-flying calculations on the OPT; multiple sources of ambient conditions (Tower, ATIS, Aircraft OAT); changing ambient conditions; different ZFW/TOW figures provided from different sources. Captains must proactively manage these conditions and decide early on a plan to minimise the risks associated. The integrity of the Final OPT Calculation and the Data Entry Procedure is paramount. 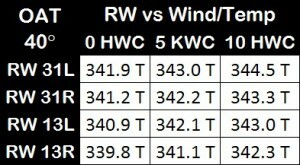 Decision Time : There may come a point where the Captain will have to make a decision on a ZFW that can be accepted based on a conservative use of the OPT and expected temperatures/conditions. The decision to take on cargo and the fuel to carry it must be balanced against the possibility of increasing temperatures that could force a cargo offload – and a delay into even higher ambient temperatures for the departure. Performance Data Entry : Captains may well find themselves having to enter critical performance data during taxi. 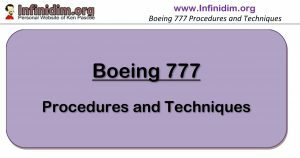 It is strongly suggested this should be done in full compliance of the Final FMC Pre-Flight entry procedure after a full cross check of the final OPT solution (from scratch) involving both operational crew members while the aircraft is halted near the departure runway. Takeoff Review and Before Takeoff Checklist is delayed until the completion of the Performance Entry Procedure.